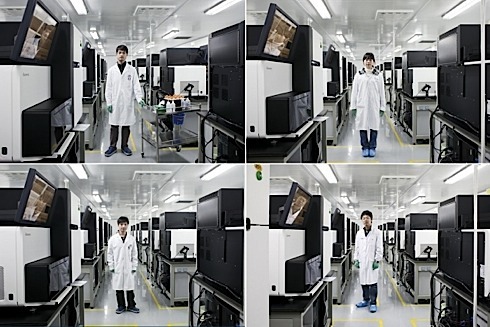 The world’s largest genome-mapping facility is in an unlikely corner of China. Lesson 1: Science will go where there is the least resistance to it. It is borderless, constantly seeking the fewest restrictions and the most investments. Research and investigation will route around legislation and prohibitions or lax enthusiasm. Science will go where it is wanted. The Illumina HiSeq 2000 is a top-of-the-line genome-sequencing machine that carries a price tag of $500,000. There are 128 of them here, flanked by rows of similar high-tech equipment, making it possible for the Beijing Genomics Institute (BGI) to churn out more high quality DNA-sequence data than all U.S. academic facilities put together. Lesson 2: China still has a predominant copy-culture, preferring to copy ideas rather than invent their own. This was true of the US for its first 100 years. English authors and inventors thought of the US as one huge continent of intellectual pirates. And it was true. But just as the US quickly outgrew its copy-culture to become a culture of originality, so too is China. The notion that China is incapable of inventing world-class innovation is wrong. The average age of the research staff is 26….Li Yingrui, 24, directs the bioinformatics department and its 1,500 computer scientists. Having dropped out of college because it didn’t present enough of an intellectual challenge, he firmly believes in motivating young employees with wide-ranging freedom and responsibility. “They grow with the task and develop faster,” he says. One of his researchers is 18-year-old Zhao Bowen. While still in high school, Zhao joined the bioinformatics team for a summer project and blew everyone away with his problem-solving skills. After consulting with his parents, he took a full-time job as a researcher and finished school during his downtime. Fittingly, he now manages a project on the genetic basis of high IQ. Lesson 3: The shift we feel towards the east is just beginning. While China is aging and breeding below replacement level, their engineers are young and have decades of productivity ahead of them. They will sway the course of science. We should find out what they are thinking. So far, at least 80,000 Western-trained Ph.D.s have returned [to China], the vast majority in the past five years. Lesson 4: A reverse brain drain is operating. And not just from the US among overseas Chinese. Many capable non-Chinese researchers are taking positions in China. I think this is good for them, for China and good for the world. It’s healthy competition for talent, and it should force more attractive conditions for research everywhere, particularly in the US, which has had little competition. China has picked up the pace of patenting and in a few decades the total number of patents from China will exceed the total in the US, once the lone superman in patenting. Again, this is good for the world, and indirectly good for the US because it will force the States to invest more in R&D, beef up education, make it more attractive for foreign talent, and easier to secure the brightest foreign students, and keep prohibitions of innovations to a minimum.